The southern part of mainland Greece consists of the large Peloponnese Peninsula. 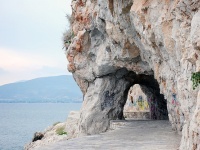 It's divided from the mainland by the Corinth Canal. The region was the ancient stomping ground of mythological heroes such as Hercules, Sisyphus, Callisto, Electra and Perseus. Today, the peninsula hosts virtually every history buff visiting the country. Indeed, most of Greece's important ancient sites are in the region. Besides the ancient ruins at Sparta, Monemvasia, Corinth, Mycenae and Epidaurus, the Peloponnese's fertile coastal strip also serves as Greece's wine-production centre. Many tourists who enter Greece by sea from Italy and other Mediterranean ports come through the Peloponnese port of Patras. The peninsula is also a playground for the Greeks themselves. Summer sees thousands of Athenians heading south for weekends at the peninsula's beaches and seaside resorts. We are looking for contributors for our Peloponnese Peninsula travel guide. If you are a local, a regular traveller to Peloponnese Peninsula or a travel professional with time to contribute and answer occasional forum questions, please contact us.